Swamp Suburbia: It's Hot Outside! The last couple of days here have been in the low 90's. You add 90 degrees to 90% humidity and you have one yucky, sticky day. So, to beat the heat we have a pool. But what good is a pool when it's rolled up in a box in the storage shed? Not a whole lot of good. I am so mechanically challenged, so, for me to put up the large pool by myself is just not going to happen. So, what do I do, I go to the Dollar Store to find some water entertainment. 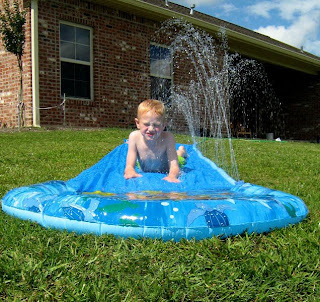 I wanted a sprinkler but they did not have any, so we went for the slip and slide. 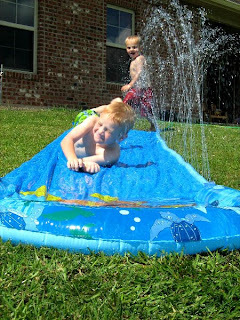 Which I think the way you are supposed to write that is Slip 'N Slide. But who knows. All I do know is that it entertained my cowpokes for a good two hours. Have you ever tried doing this as an adult? It is not fun. You seem to hit the ground a lot harder as an adult than you did when you were a child. 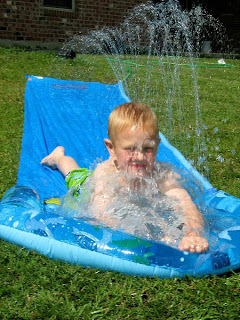 We did get a slip and slide last year, where the slide part blew up and was all bouncy when you slid. It was so much fun. Little Cowpoke was not as slippery as Big Cowpoke. It was funny to see him run, fall, and not slide anywhere. But he started to get it. Here he just decided it was easier to run as fast as he could down the slide. It was fun for a bit, but he wanted to slide like Big Cowpoke. I mean that boy can slide. She was crazy wild! He would go frontwards, backward, feet first, head first. He was just out of control. It really didn't take Little Cowpoke long to get the hang of going fast! Such joy! You would have thought that this was the coolest thing ever invented. I just love three year olds!! They are so much fun. He was just a wild man. 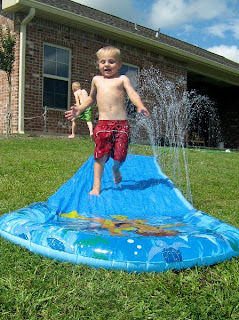 He really tried every different way possible to slide down that slip and slide. Boys are so crazy. I love it! That slide is worth every bit of the 10 bucks I paid for it. Even though I saw it at Wal Mart today on sale for 8.95. Man I hate that! Then Cowpokette needed to get in on the water action. She was not too sure she wanted to get wet. She was content on sitting in her rocking chair. There is a funny story behind her bathing suit. My oldest sister bought it for her daughter, who is now 12. She wore it, and it was passed on to my other sister, then onto me. I am not normally a fan of a two piece on a little girl, but this one is just too funny. Plus, Cowpokette doesn't go out in this one, she just sits on our back porch in it. Then if you ask her, 'Where are the boys?" This is what the princess does. That is how she points. She thought she wanted to do what they were doing. But when she got a closer look she changed her mind. Way to go Little Cowpoke, that splash there is a 10!! That slide is almost not long enough for Big Cowpoke. After Cowpokette decided she didn't want anything to do with the water slide, I put her in her little pool. She was not impressed. I think maybe the water was a bit cooler than the bath water she is used to. That is not a happy face. 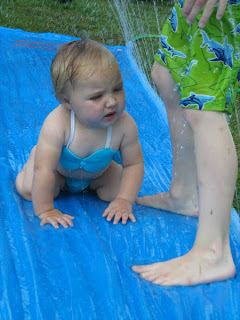 Then she wanted to try the slip and slide. We turned the water off for her. But halfway down Little Cowpoke turned the water on. Big Cowpoke came to her rescue and stood in the way of the water. He tried so hard to keep it from hitting her. She really has such wonderful big brothers. That will come in handy when she gets older. I am glad she has them to protect her. Back to her pool she went. Still, she was very concerned about those two brothers of hers. She didn't understand why they were falling over and over again. Well, Cowpokette, some advice from your mother, "You will never understand those boys and why they do the things they do." I am still trying to figure that one out! 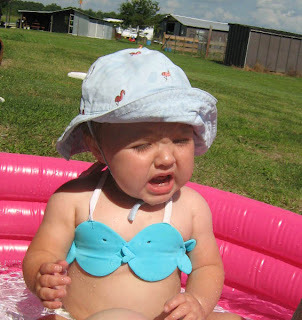 That bathing suit is absolutly hilarious on her! I love it! That bathing suit is way to cute not to use. Those are good water pictures!! 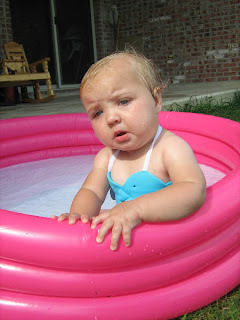 And that little girl....uhh....She is so dang cute in that little bathing suit. Oh my lord , how cute is that swimsuit ! The boys sure looked like they were having fun and I think you are right the look on her face says she is not thrilled with it at all ! My best friend's husband almost broke his neck on a slip and slide. They are definitely not for adults! Ack! Look at the cuteness of that swimsuit! 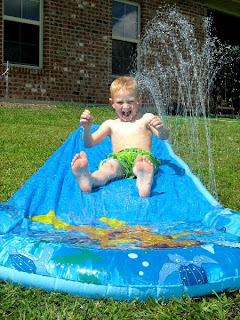 That slip-n-slide looks like a ton of fun and you got some great photos! That swimsuit is the cutest thing!! 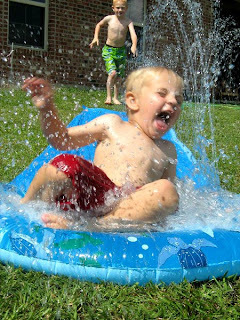 I remember those slip 'n slides...I always wanted one but we just had to play in the sprinkler. I want to steal your children and live in the milk house from your trip! 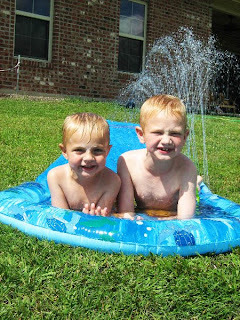 Seriously they are adorable and I hope that I take a billion pictures of my children IF I eventually have them! They will love it when they are older! I don't know how you guys do it inthe summer! I visited my grandparents in Baton Rouge one 4th of July and thought I was going to melt...literally. Awesome pictures. 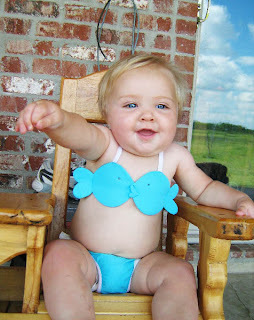 There is just something about that fishy swim suit that makes every little girl too cute for words. I think it has to do with the fat rolls. So so cute! That bikini is priceless! 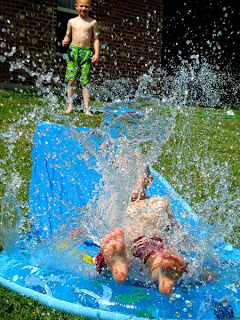 I can remember doing the slip and slide as a girl, but I cannot imagine how much pain that would cause my 37 year old bones now!